Welcome to the Amyloidosis Support Groups website. We hope you will find everything you need to know about what is happening in the world of support and awareness for Amyloidosis patients, care givers and those who have lost some one to this insidious disease. Support can come in many forms. When one is diagnosed with a rare disease such as amyloidosis; just seeing the word amyloidosis on an 8 1/ 2 by 11 sheet of colored glossy paper next to the words, “YOU ARE NOT ALONE” or “MEETING” can be supportive. The diagnosis can be a punch in the gut to hear; but to then to walk out of the office and not see a brochure, or any piece of “official” paper among the hundreds in the doctor’s office or clinic, with the word “AMYLOIDOSIS”, can be the biggest let down of all. The first Amyloidosis Support Group Meeting was held in Dallas,TX. It was hosted by La Donna Stockstill of Weatherford, TX and Muriel Finkel of Wood Dale, IL. La Donna has Amyloidosis and Waldenstrom's. Muriel's Uncle Norman Shurmaster died the previous year of Amyloidosis. 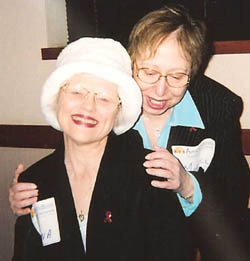 La Donna and Muriel were e-mail friends on the Amyloidosis list/serv and decided to get together with some others in the same predicament to share their experiences and provide support. Saturday March 13, 2004, was the birth of what would become one of the most popular support happenings for patients and care givers in the Amyloidosis world. The first Amyloidosis Support Group Meeting. We are a 501 (c)3 Non Profit Corporation, effective May 2005, dedicated to the Support of Amyloidosis patients and care givers and former care givers. Our goals are to set up and help maintain peer group Amyloidosis Support Group Meetings, and by raising funds through donations, help the groups to be self sustaining, and on going as long as necessary. We will also set up new groups where needed when funds allow. The President of the Amyloidosis Support Groups is Muriel Finkel, Vice President Jennifer L. Celano, Treasurer Stephen D. Finkel, Secretary Elinda Lado. For more information you may e-mail muriel@finkelsupply.com or call toll free USA 866-350-7539, 630-350-7539. 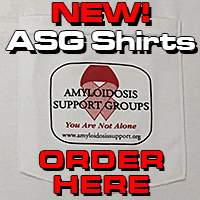 Amyloidosis Support Groups Inc., a 501 (c) 3 nonprofit corporation (will be referred to as the A.S.G. for this report) was formed for the primary purpose of starting and maintaining Amyloidosis Support Groups throughout the United States, dedicated to providing peer group support to patients, caregivers, families and friends of those touched by this life threatening disease. To fund group projects that will help in spreading awareness, co-sponsor Amyloidosis treatment and research fundraisers, and encourage grand rounds be held on amyloidosis at local hospitals and help to encourage money be raised for such projects. To maintain a 24/7 toll free “Hot/Help Line” to answer all support inquires. To provide on-going maintenance and informational updates on the A.S.G. 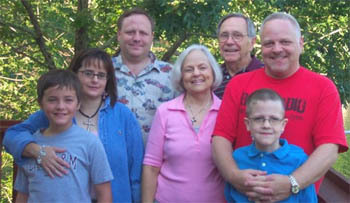 web-site (www.amyloidosissupport.org). 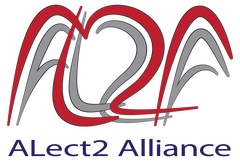 To distribute information concerning Amyloidosis symposiums, meetings and clinical trials. Our advisors are “working” advisors and not just names on a web site or letterhead. We are proud to say that we have met every one of them, and they have all contributed to the groups and answered questions. The President of the Amyloidosis Support Groups is Muriel Finkel, Vice President Jennifer L. Celano, Treasurer Stephen D. Finkel, and Secretary Elinda Lado. For more information about Amyloidosis Support Groups you may e-mail muriel@amyloidosissupport.com or call toll free USA 866-404-7539, or 630-350-7539. It is a pleasure to write a note for the first issue of the Amyloid Support Group Website. Over the past year I have watched the ASG develop and I have been amazed at the energy and commitment of Muriel Finkel and her team of leaders. Support groups dotting the United States, and indeed the world, are an important resource for all patients with amyloidosis, and especially for those with a new diagnosis who have so much to learn and often not much time to become informed. I became acquainted with amyloid diseases early in my medical career. At that time amyloid diseases were diagnosed clinically and called “primary” if no underlying disease was known, “secondary” if the patient had chronic inflammation, and “familial” if there was a family history. The 1970s was the period when the more common systemic amyloid disease proteins were identified biochemically. Patients were grateful that physicians and researchers found their disease interesting, even though little was known about the disease and even less could be done to help. Tremendous changes have occurred since then. A Nomenclature Committee was formed at the 2nd International Symposium in 1976. The Committee has met at the subsequent meetings and now lists 25 different human amyloid proteins. During the decade of the 1980s researchers found markers of each disease that helped diagnose the type after a biopsy showed amyloid tissue deposits. And in the 1990s aggressive treatments were pioneered that have made a big difference for some patients, and for the first time offered hope for those who suffer from this devastating disease. What will this decade hold? It is our goal that basic research will help us understand “why” amyloid fibrils form, and why they deposit in major organs causing life-threatening illness. Basic understanding will lead to the development of “smart” therapies that will be specific for each type of amyloidosis. Some are already in clinical trials, such as, Fibrillex for AA amyloidosis, immunomodulary drugs (Revlimid and Velcade) for AL amyloidosis, and Diflunisal which will soon be tested for TTR amyloidosis. This will be the decade of better treatments that are available for all. How can support groups help? Those of you who have been through your own or a loved one’s illness know the anxiety that comes with the diagnosis of amyloidosis. You know how hard it is for families! Support groups have the important mission of letting patients and families know they are not alone. They surround patients and families with love and attention, and give of their experience and wisdom. It is a valuable and wonderful gift of genuinely caring! Physicians and patients are grateful to all of you. It is worthwhile commenting on the value that an advocacy group, such as the Amyloidosis Support Group, provides to our patient population. As many of you know, amyloidosis is not widely recognized in the patient or in the physician community and most individuals react with “what is it”? Current technologies that allow patients to log on to a web site and get the immense amount of information available at www.amyloidosissupport.com provides immeasurable benefit to patients who frequently are in an information vacuum, unable to learn what the future holds. When using a support group patients can find out about the newest techniques and technologies and locate centers where a comfort level dealing with amyloidosis exists. Fortunately, the outlook for patients with amyloidosis has improved substantially since I began working for Dr. Kyle in 1979 and for Dr. Skinner in 1982. In that era Colchicine and oral Melphalan covered the treatment waterfront. Fortunately, today new technologies and new protocols offer hope for newly diagnosed and previously treated patients. The good news is that new agents are in continuous development and are under active testing. Frequently the information exchange available in a support group can lead patients to make decisions with regard to therapies that are suited to their temperament, personality and ability to complete. Often times physicians who do not see large numbers of amyloid are not able to keep current on what new therapies are available, which is an important benefit of communication within the support group. The rarity of amyloidosis means that most practicing physicians will never see a patient with the disease and most practicing hematologists will never see sufficient numbers to really have a feel for the disorder. 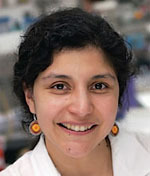 They often are forced to make decisions based on text book descriptions, which can be out of date due to the turnover time required for publication. As in all fields, the best teacher is experience and medicine remains an art with four years of apprenticeship in medical school and often times up to seven years of journeyman training before one is ready to be a master of the art. There is hope. Hundreds of research papers on amyloidosis are currently being published annually. It is one of the few rare diseases that has a journal completely dedicated to itself, edited by Dr. Alan Cohen. Many support groups sponsor travel awards for young scientists to motivate their interest and a number will be attending the next amyloidosis meeting in Woods Hole, Massachusetts to learn and discuss new scientific discoveries in amyloidosis. It is exciting to know there are individuals dedicated to solving the mystery of amyloidosis. There were 200 scientist/physician attendees at the last international meeting. Support groups allow patients and their families to educate themselves and knowledge is power. It is worth remembering that information can be confusing and sometimes there are testimonials on the web that do not meet the standards for scientific publication, but sometimes even hearsay information is better than none at all. When reading about amyloidosis it is important to not over-interpret statistics because they are not very helpful at an individual level and even experts can have honest disagreements about the role of the various available therapies. How can you help yourself? First, ask questions. Your physician should not feel threatened. You need to be satisfied with the answers and the explanations, even if the news is not always good. Patient advocacy groups play an enormous role. Site information is frequently filtered for accuracy and can be used to direct learners to the best resources available. The talk list allows patients to ask each other questions and reinforce common issues, as well as provide emotional support. Since members are dealing with other patients with the disease, there is a wealth of experience and empathy that is available. Support groups can also link to other resources on the disease and frequently have arms that support research. Full access to information is important for patients to make informed choices. Support group meetings are useful for educational purposes (but not to get a free second opinion). It is important to attend to your lifestyle. Do you exercise daily? How are you coping emotionally with your diagnosis? Are you eating healthy? Do you live a healthful daily routine? How can you help? Participation in clinical trials of amyloid treatment are useful. There is no animal model of amyloidosis to test new treatments. Patient volunteers are required to develop better treatment for future generations. Let the next important breakthrough be tested on you. Ask your physician if you can participate in a trial of therapy. This information will certainly help others with the disease and you, therefore, contribute by providing hope to other patients, which is a uniquely human trait.